Digital Timing | Tennessee Aircraft Services, Inc. Timing the mags on an aircraft engine is one of the most common maintenance events we perform. In an age of everything computerized, or at least digital, the faithful old magneto is pretty old school. Back in the early sixties, Slick aircraft magneto parts were in short supply and many aircraft mechanics discovered the tractor version of the Slick mags had most all the same parts. Not much has changed in their basic design so it stands to reason we can use old school methods and tools to time these old (and new) mags as well. However, just because we can doesn’t mean we should. We can use more sophisticated dynamic timing methods on cars because they typically don’t have a 60 pound meat cutting blade attached to the crankshaft at the front. With the engine running on my old MGB I used a strobe light triggered by a coil clamped on the #1 cylinder spark plug wire. The strobe would flash on a fixed pointer mounted at the engine flywheel. 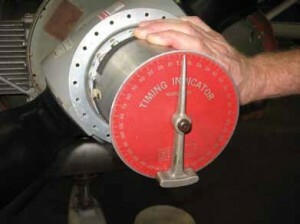 A painted mark on the fly wheel would be highlighted by the strobe and the timing of the engine spark would be adjusted to align the mark with the pointer while the engine was running. For the stated obvious safety reason the piston aircraft world is relegated to using stationary timing methods. Since our engines don’t have any sort of automatic timing advance we can time the engine statically with very good results. All the Cessna Service manuals have instructions on timing the magneto to the engine. The concepts are identical and the procedures very similar. The Teledyne Continental Motors (TCM) geared engine mounted on the 175, 411, and 421 requires a different approach because the rotation angle of the propeller does not match that of the engine. More information on timing can be found in each engine manufacturers service manuals and certain service documents. Textron Lycoming has published Service Instruction 1437 with some details on their timing marks. TCM produced mandatory Service Bulletin MSB94-8C for magneto to engine timing procedures, from which a good deal of this article is based. Final guidance from the factories is stamped on every engine data plate. That information is the number of degrees of crankshaft rotation before each piston reaches the top dead center (TDC) at which the ignition system fires the spark plugs. A very few exceptions occur if an FAA airworthiness directive has been issued changing the degrees for a specific engine model. This occurred on some of the small TCM engines and a couple of Lycoming engines. Lycoming engines have a large flywheel mounted on the crankshaft where the propeller is mounted. This fly wheel has a gear ring press fit around its outer circumference that the starter motor gear engages to rotate the engine during the engine start process. Since this flywheel is bolted directly to the crankshaft and easily accessible during maintenance it is an ideal location to place timing marks. There are timing marks on the aft side of the Lycoming fly wheel that will reference to the split in the crank case halves. There are also marks on the front of the same fly wheel that reference to a drill hole in the face of the starter case. TCM engines have had timing marks in several places. Some TCM engine types with rear mounted alternators had timing marks on the aft pulley but the pulley could be mounted in different rotations thus changing the position of the marks relative to the crankshaft. Some TCM engine have a cap that can be removed from the front left of the crank case which allows a view of the crankshaft inside the engine with timing marks. Others had marks on the crankshaft flange that wouldreference to the split in the crank case halves. For various reasons most of these marks are either no longer being installed or not being used due to inaccessibility. The final and universal TCM solution was MSB94-8C. Whether timing a magneto to a TCM or Lycoming engine, the first step is the same; find top dead center (TDC) compression stroke for cylinder #1. Step 2 is set the crankshaft to a position in rotation prior to TDC as stated on the engine data plate for the magneto timing advance. Last, rotate the magneto so its points contacts open at this specific point. There are old ways, new ways, old tools, and new tools to get this done. Determining when the mag points open is primarily done with a timing light. Precisely determining the rotation angle before TDC at which this occurs is the real trick. 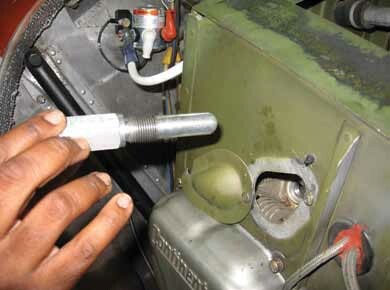 One method is to touch a rod to the piston top through the spark plug hole. At TDC the piston will change from rise to fall. One can watch the rod extend until it comes to a stop then begins to go back in. Finding that peak point is TDC position of that piston. Unfortunately, the movement of the piston near TDC is almost undetectable. Finding TDC within less than one degree using this method is difficult. 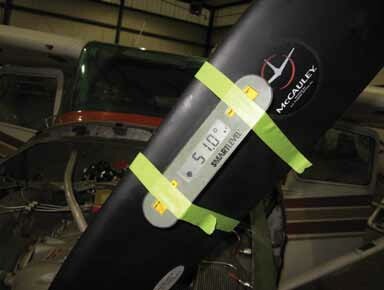 While the timing marks on the Lycoming fly wheel are very accurate and easy to see, using them on some airplanes requires removal of extra cowling components. I have grown to like the method described in TCM MSB94-8C which can be used on TCM or Lycoming engines. For some, the directions in the service bulletin lack clarity and reason. Even though blindly following the instructions will get you to TDC, it is really really nice to understand exactly what is happening. The “flower pot” held in position on the propeller dome. When actually used it would be secured with rubber bands. The MSB calls for using the “flower pot” for determining degrees of rotation of the crankshaft. This is a very old, very simple, very reliable, but not particularly precise method of determining the rotational position of the crankshaft. Any real expectation of precision is lost with the very thick pointer and only whole degree marks on the scale. Continuously tapping on the flower pot to overcome the friction that keeps the pointer from finding its true vertical position. Picture #1 shows the flower pot being held against the propeller hub which keeps the assembly in a fairly correct position but the normal mounting in on the end of the spinner dome. Getting the thing squarely placed on the spinner dome and the pointer shaft horizontal is difficult. A simple digital level does not have the friction problems of the mechanical pointer on the flower pot. It is also far less sensitive to its mounting position. I found a digital level much easier to read and yields more repeatable precise results. They aren’t very expensive and any shop doing much flight control rigging will likely have one. 1. Remove the top spark plug on #1 cylinder and the bottom plugs on the others. This helps prevent “stuff” from falling in the other cylinder when you’re not looking. 2. Find approximate TDC on #1 cylinder by placing your thumb over the spark plug hole while turning the prop in its normal direction. Pressure will build at the spark plug hole as the piston approaches the top of the cylinder on the compression stroke. Continuing rotation past TDC will cause a vacuum at the spark plug hole. This transition point is where the piston peaks and is TDC. 3. Reverse rotation about a quarter turn before the approximate TDC point. 4. 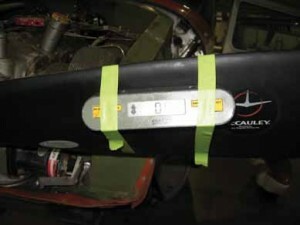 Mount the digital level on one of the propeller blades. (picture #2) It won’t matter which one so just pick one that makes reading the level most convenient. Actually, the level can be mounted almost any place on the propeller but is less confusing to most operators if mounted on a propeller blade laterally from hub to tip. 5. A piston position stop plug is now installed in the #1 spark plug hole. (picture #3). The idea from this point is to determine the angle of crankshaft rotation from where the piston touches the stop plug to TDC. The principle is this angle will be exactly the same when approached from a clock wise or counter clock wise rotation. Because the piston will contact the plug well before TDC, it will have much more movement relative to rotation of the crankshaft thus giving a more precise angle reading. Find the angle when approached in clockwise rotation and when approached counter clockwise and the average the two readings, or half way in between, to get a very precise location of TDC for that piston. 6. Very gently rotate the prop in normal rotation until you feel it hit a stop. This will be the piston touching the finder. There is a lot of mechanical advantage when turning the prop so try real hard not to punch a hole in the piston top with the stop plug. Note the exact degree on the digital level. Better yet, reset the level to read zero at this position. 7. Then rotate the prop in reverse rotation until the piston again touches the stop plug. Still being gentle. Note the angle displayed on the level. Propeller rotated backwards with the piston against the stop plug. Noted angle of 51.0 degrees. 8. The position of TDC is exactly centered between the two positions noted in step 6 and step 7. Calculate the average of the two readings to find the angle the level should read when at the TDC position. 9. Rotate the propeller forward again near the position in step 6. 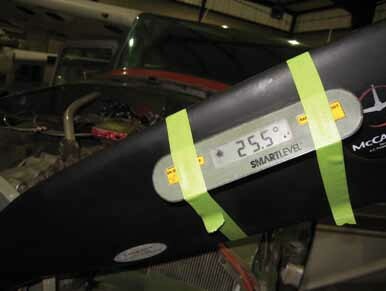 Remove the stop plug and continue to rotate the propeller until the level displays the angle calculated in step 8. . Propeller rotated forward past the original zero point at the piston stop to the half way angle of 25.5 degrees. 10. The crankshaft is now in the position that places the piston of the #1 cylinder at its exact top center location 11. Being careful not to move the prop, reset the level to now read zero in this position. Digital level reset to 0.0 degrees while the engine set at TDC. Ready to time the mags. 12. As a double check, be sure this is near the #1 cylinder compression as found in step 3. 13. You can now back the propeller to any timing rotation point you want with the level displaying the exact angle before TDC. From this point on the magneto to engine timing procedures are as published in the aircraft or engine documentation Basically slowly rotate the propeller in its correct rotation through the published timing position. Note the angle on the digital level when the timing light comes on for each magneto. Carefully adjust each magneto so its points open at the exact angle needed. 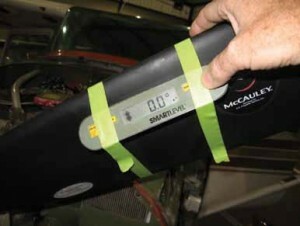 Finding TDC using the TCM method is very precise and accessible on any engine. The digital level helps maintain that level of precision. It is pretty nice to actually understand why the procedure works and being able to see it clearly on a modern precise instrument is icing on the cake. I first substituted a digital level for the flower pot about 10 years ago when I couldn’t find my flower pot and I’ll not go back.